Claude Monet (14 November 1840 - 5 December 1926) was a founder of French Impressionist painting. He adopted a method of painting the same scene many times in order to capture the changing of light and the passing of seasons. From 1883 Monet began a vast landscaping project and from 1899 he began painting waterlilies. Monet struggled with depression, poverty and illness throughout his life. He died from lung cancer in December 1926 at the age of 86. 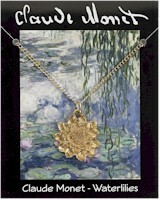 This Waterlily model is made from gold plated pewter and is supplied on a gold plated chain. The information card gives a brief outline of Claude Monet's life as an artist. Gold plated Owl supplied on hypoallergenic ear wires. The information on the reverse of the card describes how the owl was a powerful symbol and also the other earrings available.